Palmako Double Log Cabin Garage a fantastic quality timber garage which is a perfect, much less expensive and generally better value that the brick built alternatives. The natural wood finish is also a much more attractive feature in the garden. Featuring optional side hinged garage doors or classic up and over garage doors. 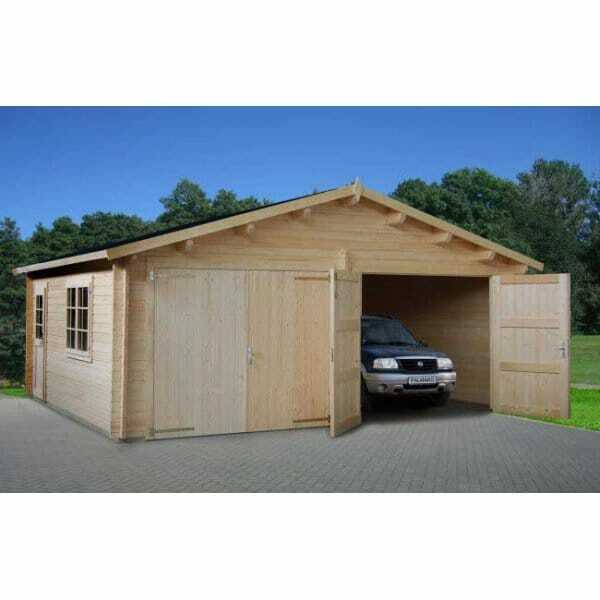 This Log Cabin Double Garage is quite simply one of the best value Wooden Garages on the timber garage market. If the Log Cabin Garage is to be assembled in a restricted space; there should be an allowance made for roof overhang to the both sides and rear of the building of 30cm roof overhang. In common with most log cabins this log cabin garage is delivered untreated and will require the application of a good quality timber preservative.